Not all writers begin their stories at the same place. Since 'Once upon a time' isn't half so important as the 'Happily ever after', it is no strike against her that Marie-Célie Agnant didn't begin her personal narrative at the same start as others in the field of literature, as an aspiring writer. Born in the Haitian capital city, Port-au-Princ, in 1953, Agnant worked as an interpreter and as a translator for many years. After moving to Quebec, Canada at the start of the 70's she also worked as a French teacher before reentering the world as a storyteller. With many shorts, full blown novels, children's books and poems under her belt, Agnant has truly transitioned into a storyteller of more than simple worth to the Haitian literary heritage. Her works, including those which have received accolades: 'La Dot de Sara', finalist for the 1995 Desjardins literary prize, 'Le Silence comme le sang', 1997 finalist for the Governor General's Award and those of more modest note, 'L'oranger magique: conte d'Haïti', have been translated into several languages including English, Italian, Spanish, Korean and Dutch. 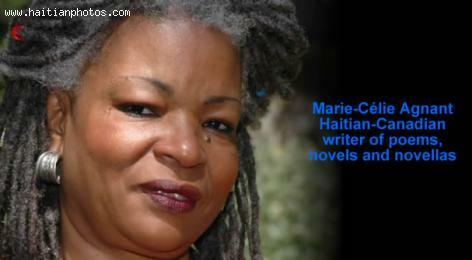 Her work is also regularly published on markets in Haiti, Canada and France. Though she started the journey at a later, less conventional point, Agnant has met certain success and enjoys being able to tour the world on the strength of her books due to their tilt towards the female status and perspective in today's society, all while dealing with the matters of racism, exile and loneliness etc. Still a residence of Canada, she also parlays her storytelling and theater interests into appearances on the stage with Vermont's Bread & Puppet Theater.